Arnold Schwarzenegger said he'd be back, but so far audiences haven't exactly welcomed him with open arms. 'The Last Stand' and 'Escape Plan' may have underperformed at the box office, but that's not stopping the Austrian Oak from continuing his post-Governor action career and 'Sabotage' looks like more of the same, for better or for worse. A new poster for the film debuted at IGN and it's exactly what you'd expect from this kind of movie. As you can see below, the poster plants Arnie front and center, armed to the teeth and ready to shoot whatever nameless baddie crosses his path. The film's solid supporting cast (and their crazy hairdos and facial hair) back him up, each and every one of them ready to put a few bullets in someone's face. 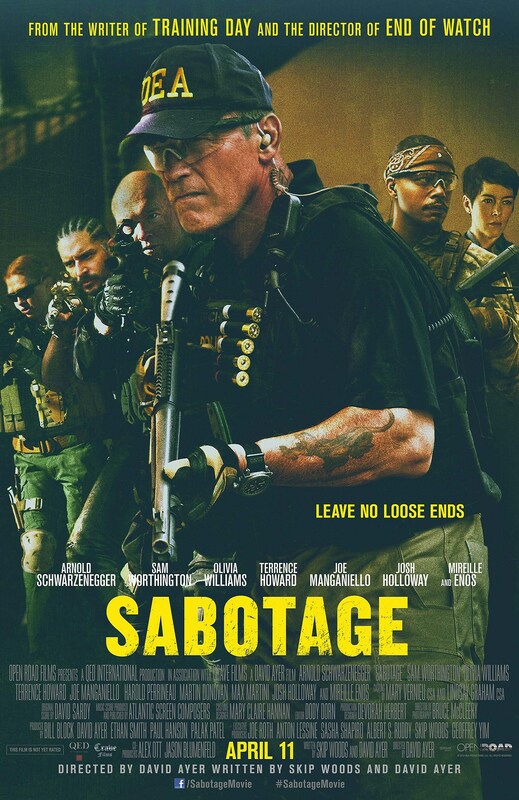 Interestingly, this is the rare Schwarzenegger film that seems to give plenty of real estate to the supporting cast, but why waste the likes of Sam Worthington, Terrence Howard, Olivia Williams and Josh Holloway? We can't make any snap judgments about a movie based on its poster (so we won't), but we can say that writer/director David Ayer has written and directed his fair share of solid movies and we're always happy to see Schwarzenegger at any age, so consider us on board for this one. Hey, it can't be any worse than the 'Expendables' films, right? 'Sabotage' opens on April 11, 2014. Click on the poster below to check out a much larger version.